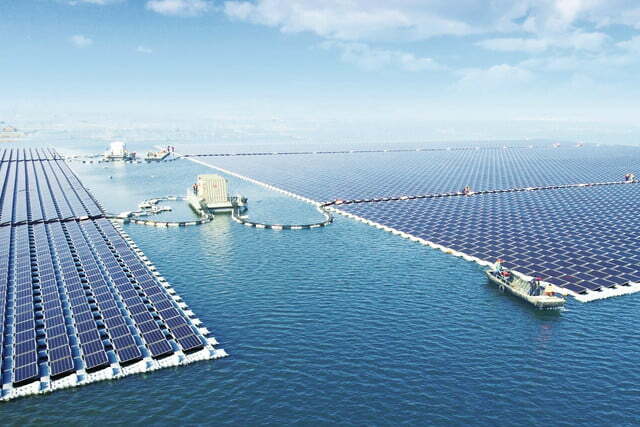 The world’s largest floating photovoltaic (PV) facility (pictured) has been connected to the local power grid. Located in the city of Huainan in the Anhui province, the 40-megawatt facility was manufactured by Sungrow Power Supply Co. The floating grid has been constructed over a flooded former coal-mining region. This is the second such facility in the region following the opening in 2016 of a 10 sq. mile area 20MW facility, the Longyangxia Dam Solar Park. With the increase in PV manufacture, the cost of solar power is predicted to fall by one third by 2020, with price parity with coal predicted within a decade. The craze to develop a flying car has been joined by Toyota, who are supporting ‘Cartivator’ a start-up developing a 2.9 metre long vehicle. The project is being undertaken by 30 young volunteers under the supervision of Masafumi Miwa from Tokushima University. The aim of the project is to have a prototype flying by 2018 and to commercialise in time to light the Olympic torch at the 2020 Tokyo Olympic Games. According to its Zenmono crowdfunding page, the car will be able to take off from any public road and fly at a speed of 62 mph, at a height of 10 metres above ground level. Rapid charging of batteries is a widely pursued goal by researchers. Work recently published by Prof John Cushman of Purdue University has developed a technique for replenishing the electrolyte in a cell with a charged liquid, a concept analogous to refueling with petrol. The science is based around redox reactions in immiscible fluids, the liquid being ‘charged up’ for example using a PV panel or wind farm. Prof Cushman has set up a company to exploit his invention - IFBattery LLC. Magnetic materials are widely used in applications such as memory devices, where faster and smaller are always key targets. A team led by Prof Xiaodong Xu at the University of Washington and Prof Pablo Jarillo-Herrero at the Massachusetts Institute of Technology has discovered magnetism in a monolayer of Chromium Triiodide. The work, publised in June 8th edition of Nature, used the technique of sticky tape to detach a single layer. The magnetic effect was seen in a monolayer and trilayer but not in a bilayer, indicating an anti-ferromagnetic ordering. Although the bulk CrI3 material is ferromagnetic, it does not always follow that a monolayer will show the same behaviour. Future work will examine the potential for exploiting heterogeneous layered materials. Control of robotic vehicles depends on the software and hardware ‘brain’. A spin-out from Oxford University, Oxbotica, has developed an autonomous control system called Selenium which can work on any vehicle, including forklifts and cargo pods . The software takes inputs from lasers and cameras to calculate the optimum route, and the technology is running on Oxbotica’s fleet of vehicles, a delivery van, the ESA Mars Rover, and the £8 million GATEway (Greenwich Automated Transport Environment) project in London. 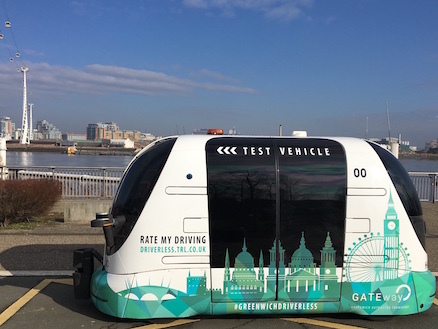 The GATEway project will run 8 driverless pods, which look very similar to those developed by Professor Martin Green at Bristol University, as used at Heathrow T5. The system computes three parameters: 1/ Where am I? - Using cameras and lasers to precisely locate without GPS; 2/ What’s around me? Using sensors and algorithms to identify and track pedestrians, cars and other obstacles in the environment; 3/ What do I do next? Calculates a safe and efficient route to drive to the destination. NB: Check out the ‘Rate My Driving’ sticker above. QDs are the basis for many LED displays and lighting. Dotz Nano claim that their new graphene QDs overcome some of the shortcomings of conventional materials, such as reliably achieving blue light. Their initial target application is, surprisingly, optical brighteners for textiles. Fluorophores easily wash out and hence are relatively ineffective, whereas Dotz Nano are looking to incorporate GQDs onto the fibres. Anti-counterfeiting is one of the future potential application. The technology was spun out of Rice University in 2014 by Professor James Tour. The headline of ‘London to Manchester in 18 minutes’ is quite an eye-catcher (NB: has anyone has calculated how many ‘G’ you pull accelerating and decelerating?). Of course, it is Elon Musk’s latest project, and those old enough to remember the capsules put into vacuum tubes that shops used to take cash from the tills to the cash office will guess how this works – by giant vacuum tubes. Arup have been doing a feasibility study for the UK, but a working demonstrator has yet to be built, so early days. Not many people realise that the Lithium Ion battery was invented at University of Oxford by US scientist Professor John Goodenough. Now based at the University of Texas and aged 94, he is still inventing. His new battery uses a solid glass electrolyte which conducts ions rather than a liquid electrolyte. He commented: "Cost, safety, energy density, rates of charge and discharge and cycle life are critical for battery-driven cars to be more widely adopted. We believe our discovery solves many of the problems that are inherent in today’s batteries". This story, I admit, had me pondering for a while. Researchers at KTH have developed a system to create an electronic wind around heavy good vehicles to reduce wind resistance. The system uses plasma high voltage electrodes or ‘actuators’ to charge the air, which is accelerated forming an electronic ‘wind’. This causes vortices, which in conditions such as cross winds, allows control of the air flow and boundary layer around the truck resulting in reduced drag. The outcome is a 5% reduction in fuel consumption. At the recent Geneva International Motor Show, Goodyear launched a new spherical tyre concept, aimed at autonomous vehicles. Named the Urban 360, it is produced by 3D printing, and can adapt to the surface it is travelling on. The ‘bionic skin’ contains sensors and a foam-like core which can expand and contract under the control of AI. The result is to produce a ‘dimpled’ surface for wet conditions, and smooth for dry surfaces. Researchers at University of Colorado have published a paper in Science describing production of a glass/polymer hybrid metamaterial film. When applied to a building, it is claimed that the film has the combined effect of reflecting solar radiation, as well as allowing thermal radiation from the substrate, resulting in enhanced passive cooling of a building or structure. According to Xiaobo Yin, co-director of the research, ‘We feel that this low-cost manufacturing process will be transformative for real-world applications of this radiative cooling technology,’ said published in Science. Sitting in a traffic jam on the M25 (other jams are available), we have all, I am sure, wished we could take off and fly. Well, that idea is nearer reality with the latest human-carrying drone vehicle from China, the eHang 184. Carrying a passenger up to 100kg, it can travel for 30 minutes at up to 100mph on a single battery charge. Already tested in Nevada, it is due to run regular operations in Dubai from July 2017. The ‘pilot’ uses a touchscreen to select a destination and the drone is operated by remote auto-pilot from a command centre . If the above drone flight isn’t enough of an adrenalin rush for you, Blue Origin, run by Jeff Bezos, are progressing with their rocket to take fare-paying passengers into space. The ‘New Shepherd’ sub-orbital rocket has already been tested and work is now underway on the BE-4 propulsion unit being developed for the ‘New Glenn’ orbital rocket. Using four engines, the rocket will be powerful enough to take passengers into orbit around the earth. Meanwhile, the European Space Agency has launched the second Sentinel 2 earth observation satellite on board a Vega rocket. As part of the Copernicus programme to monitor the health of the earth, the satellite will become part of a cluster of Sentinel satellites. Currently, Sentinel 2A has been launched in opposite orbit, and provides an open resource of the earth which will be updated very 5 days . Bringing down the cost of manufacturing Li-ion batteries is an important target. Researchers at Tohoku University have used recycled waste silicon sawdust to produce lower-cost battery anodes. In silicon wafer production, 50% of Si is discarded as industrial waste in the final cutting process, producing about 90 thousand tons a year worldwide. A research initiative led by Dr Jason Robinson at the University of Cambridge has coupled graphene with a superconducting material - praseodymium cerium copper oxide (PCCO) and found that the graphene exhibited superconductivity. Superconductivity has been produced by other methods such as intercalation of elements such as calcium, but switching on the ‘intrinsic’ superconductivity which graphene should theoretically exhibit has not been previously achieved. Other research at the Univeristy of Cambridge has developed a graphene-based pyroelectric bolometer that detects infrared (IR) radiation to measure temperature with an ultrahigh level of accuracy. The work, published in Nature Communications, demonstrates the highest reported temperature sensitivity for graphene-based uncooled thermal detectors, capable of resolving temperature changes down to a few tens of µK from a few nano-Watts of IR radiation power . Cars Powered by Salt Water? Flow cell energy storage technology has traditionally been limited to large, static installations. 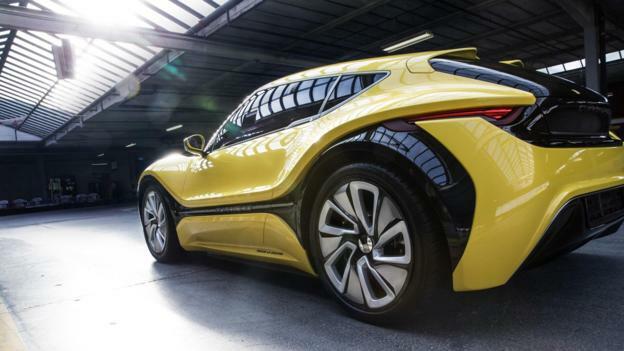 NanoFlowCell have developed a mobile electric drive unit which they have demonstrated in the Quantino sports car (see image). 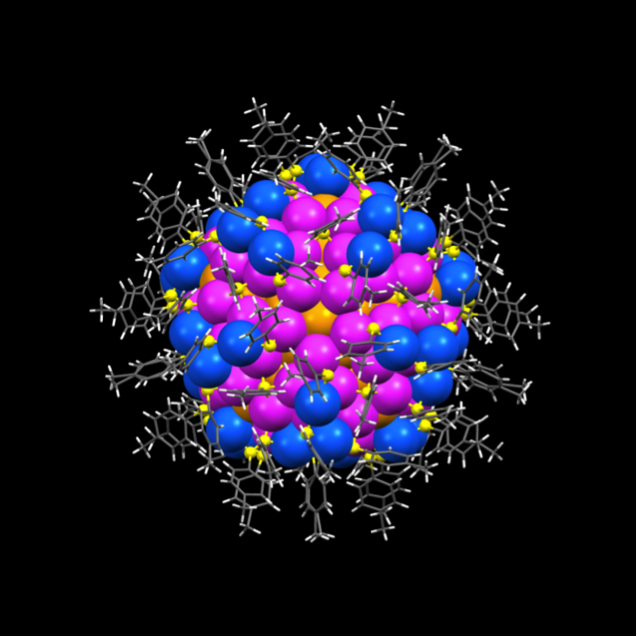 In contrast to conventional batteries, the nanoFlowcell® is provided with energy in the form of liquid electrolytes (bi-ION). The positively and negatively charged electrolyte liquids are stored separately in two tanks and are pumped through a converter cell in separate circuits. A permeable membrane allows ion exchange which generates a current. A novel feature is the low voltage of the system (48V). The used electrolyte is filtered to remove salts and expelled, with liquid refueling similar to a conventional IC engine, and the main emission is water.